The organization of the sport process: The perspective of elite volleyball Brazilian coaches. The purpose of this study was to analyze the coaching knowledge of 24 expert high-performance Brazilian volleyball coaches in the organization of training and competition. A semi-structured interview was used, and the resulting data analyzed following the procedures outlined by Côté and colleagues (Côté & Salmela, 1994, 1996; Côté, Salmela, & Russell, 1995a, 1995b). Overall, the data highlighted that the coaches of male and female teams organized competition and training similarly. Additionally, the organization component comprised not only the planning of training and competition, but also a constant social interaction with the athletes, the athletes’ significant others, the assistant coaches and other technical staff, as well as other sport agents (e.g., administrators). The overall trends are primarily discussed in relation to existing research. Araşjo, J. (2009). Ser treinador (3rd ed.). Alfragide: Texto Editores. Baker, J., Horton, S., Robertson-Wilson, J., Wall, M. (2003). Nurturing sport expertise: Factors influencing the development of elite athletes. Journal of Sports Science and Medicine, 2: 1-9. Beal, D. (2005). Buscando a excelência em um programa: Indo para o ouro. (D. Shondell, C. Reynaud, Orgs. ), A bíblia do treinador de voleibol, pp. 63-71. São Paulo: ArtMed. Bizzocchi, C. (2008). O voleibol de alto nível: Da iniciação à competição (3rd ed.). São Paulo: Manole. Blau, G.J., Boal, K.R. (1987). Conceptualizing how job involvement and organizational commitment affect turnover and absenteeism. Academy of Management Review, 12 (2): 288-300. Bloom, G. (1996a). Life at the top: Philosophies of success. (J.H. Salmela, Ed. ), Great job coach Getting the edge from proven winners, pp. 36-65. Ottawa: Potentium. Bloom, G. (1996b). Characteristics, knowledge, and strategies of expert team sport coaches. Doctoral dissertation. Ottawa, Ontario: University of Ottawa. Bloom, G. (2002). Coaching demands and responsibilities of expert coaches. (J.M. Silva, D.E. Stevens, Eds. ), Psychological foundations of sport, pp. 438-465. Boston: Allyn and Bacon. Bloom, G. (2011). Coaching psychology. (P.R.E. Crocker, Ed. ), Sport and exercise psychology: A Canadian perspective (2nd ed. ), pp. 278-305. Toronto: Pearson. Bloom, G., Crumpton, R., Anderson, J.E. (1999). A systematic observation study of the teaching behaviors of an expert basketball coach. The Sport Psychologist, 13(2): 157-170. Bloom, G., Durand-Bush, N., Salmela, J. (1997) Pre- and postcompetition routines of expert coaches of team sports. The Sport Psychologist, 11: 127-141. Bloom, G., Horton, A., McCrory, P., Johnston, K. (2004). Sport psychology and concussion: New impacts to explore. British Journal of Sports Medicine, 38: 519-521. Bloom, G., Loughead, T. (2011). Current developments in North American sport and exercise psychology: Team building in sport. Revista Iberoamericana de Psicologia del Ejercicio y del Deporte, 6 (2): 237-249. Bloom, G., Stevens, D., Wickwire, T. (2003). Expert coaches' perceptions of team building. Journal of Applied Sport Psychology, 15 (2): 129-143. Bojikian, J. (2008). Ensinando voleibol (4th ed.). São Paulo: Phorte. Bompa, T. (2009). Entrenamiento de equipos deportivos. Barcelona: Editorial Paidotribo. Brandão, M., Krebs, R. (2010). Psicologia e voleibol: Uma perspectiva bioecológica. (M.R.F. Brandão, A.A. Machado, Ed. ), Coleção psicologia do esporte e do exercício: O voleibol e a psicologia do exporte (vol. 5), pp. 29-47. São Paulo: Atheneu. Brislin, G. (1997). Physical training factors in coaching volleyball. (K.S. Asher, Ed. ), Coaching volleyball: American volleyball coaches association, pp. 229-245. Chicago: Master Press. Buceta, J. (2010). Psicologia dos treinadores esportivos: Conceitos fundamentais e áreas de intervenção. (M.R.F. Brandão, A.A. Machado, Eds. ), Coleção psicologia do esporte e do exercício: O voleibol e a psicologia do esporte (vol. 4), pp. 17-40. São Paulo: Atheneu. Burton, D. (1993). Goal-setting in sport. (R. Singer, M. Murphey, L. Tennant, Eds. ), Handbook of research on sport psychology, pp. 467-491. New York: Macmillan. Carter, A., Bloom, G. (2009). Coaching knowledge and success: Going beyond athletic experiences. Journal of Sport Behavior, 32 (4): 419-437. Chelladurai, P. (2007). Leadership in sports. (G. Tenenbaum, R. Eklund, Eds. ), Handbook of sport psychology (3rd ed. ), pp. 113-135. Hoboken: John Wiley. Chelladurai, P., Saleh, S.D. (1980). Dimensions of leader behavior in sports: Development of a leadership scale. Journal of Sport Psychology, 2: 34–45. Clemens, T. (2005). Levantamento. (D. Shondell, C. Reynaud, Orgs. ), A bíblia do treinador de voleibol, pp.193-202. São Paulo: ArtMed. Corbin, J., Strauss, A. (2008). Basics of qualitative research: Techniques and procedures for developing grounded theory (3rd ed.). Los Angeles: Sage. Côté, J. (2006). The development of coaching knowledge. International Journal of Sports Science and Coaching, 1 (3): 217-222. Côté, J., Salmela, J. (1994). A decision-making heuristic for the analysis of unstructured qualitative data. Perceptual and Motor Skills, 78: 465-466. Côté, J., Salmela, J. (1996). The organizational tasks of high-performance gymnastics coaches. The Sport Psychologist, 10 (3): 247-260. Côté, J., Salmela, J., Russell, S.J. (1995a). The knowledge of high-performance gymnastics coaches: Methodological framework. The Sport Psychologist, 9: 65-75. Côté, J., Salmela, J., Trudel, P., Baria, A., Russell, S.J. (1995b). The coaching model: A grounded assessment of expert gymnastic coaches’ knowledge. Journal of Sport and Exercise Psychology, 17: 1-17. Côté, J., Salmela, J., Russell, S.J. (1995c). The knowledge of high-performance gymnastics coaches: Competition and training considerations. The Sport Psychologist, 9: 76-95. Côté, J., Sedgwick, W. (2003). Effective behaviors of expert rowing coaches: A qualitative investigation of Canadian athletes and coaches. International Sports Journal, 7(1): 62-77. Debanne, T., Fontayne, P. (2009). A study of a successful experienced elite handball coach’s cognitive processes in competition situations. International Journal of Sports Science and Coaching, 4(1): 1-16. Demers, G., Woodburn, A., Savard, C. (2006). The development of an undergraduate competency- based coach education program. The Sport Psychologist, 20: 162-173. Dixon, M., Bruening, J. (2007). Work-family conflict in coaching I: A top-down perspective. Journal of Sport Management, 21: 377-406. Dixon, M., Warner, S. (2010). Employee satisfaction in sport: Development of a multi-dimensional model in coaching. Journal of Sport Management, 24: 139-168. Eccles, D., and Tenenbaum, G. (2007). A social-cognitive perspective on team functioning in sport. (G. Tenenbaum, R.C. Eklund, Eds.). Handbook of sport psychology (3rd ed. ), pp. 264-283. Hoboken: John Wiley. Eys, M., Burke, S., Carron, A., Dennis, P. (2006). The sport team as an effective group. (J.M. Williams, Ed.). Applied sport psychology: Personal growth to peak performance (5th ed. ), pp. 157-173. New York: McGraw-Hill. Ericsson, K., Simon, H. (1993). Protocol analysis: Verbal reports as data (rev. ed.). Cambridge: MIT Press. Erickson, K., Côté, J., Fraser-Thomas, J. (2007). Sport experiences, milestones, and educational activities associated with high-performance coaches’ development. The Sport Psychologist, 21: 302-316. Fletcher, D., Hanton, S. (2003). The relationship between psychological skills usage and competitive anxiety responses. Psychology of Sport and Exercise, 2: 89-101. Ford, P., Yates, I., Williams, M. (2010). An analysis of practice activities and instructional behaviours used by youth soccer coaches during practice: Exploring the link between science and application. Journal of Sports Sciences, 28 (5): 483-495. Fox, A. (2006). The importance of coach control. International Journal of Sports Science and Coaching, 1: 19-21. Garganta, J. (2003). Fştbol: del juego al entrenamiento, del entrenamiento al juego. Training Fştbol, 85: 14-17. Gilbert, W., Trudel, P. (2004). Role of the coach: How model youth team sport coaches frame their roles. The Sport Psychologist, 18: 21-43. Gilligan, C. (1992). Uma voz diferente: Psicologia da diferença entre homens e mulheres da infância à idade adulta. Rio de Janeiro: Rosa dos Tempos. Gould, D. (1987). Your role as a youth sport coach. (V. Seefeldt, Ed. ), Handbook for youth sport coaches, pp. 17-32. Reston, VA: American Association for Health, Physical Education, Recreation, and Dance. Johnson, U., Andersson, K., Fallby, J. (2011). Sport psychology consulting among Swedish premier soccer coaches. International Journal of Sport and Exercise Psychology, 9 (4): 308-322. Johnston, K., Bloom, G., Ramsay, J., Kissick, J., Montgomery, D., Foley, D., Chen, J., Ptito, A. (2004). Current concepts in concussion rehabilitation. Current Sports Medicine Reports, 3 (6): 316–323. Jones, R., Wallace, M. (2005). Another bad day at the training ground: Coping with ambiguity in the coaching context. Sport, Education and Society, 10 (1): 119-134. Kasznar, I., Graça Filho, A. (2002). O esporte como indşstria: Solução para criação de riqueza e emprego. Rio de Janeiro: Confederação Brasileira de Voleibol. Kellett, P. (1999). Organizational leadership: Lessons from professional coaches. Sport Management Review, 2 (2): 150-171. Lewis, T. (2008). An explanatory model of student-athlete drinking: The role of team leadership, social norms, perceptions of risk, and coaches' attitudes toward alcohol consumption. College Student Journal, 42 (3): 818-831. Lincoln, Y., Guba, E. (1985). Naturalistic inquiry. Beverly Hills: Sage. Locke, E., Latham, G. (1990). Work motivation and satisfaction: Light at the end of the tunnel. Psychological Science, 1: 240-246. Mesquita, I. (2005). A pedagogia do treino: A formação em jogos desportivos colectivos. Lisboa: Livros Horizonte. Mesquita, I., Graça, A. (2002). Conhecimento estratégico de um levantador de alto nível. Revista Treino Esportivo, 17: 15-20. Moreno, M. (1999). Como se ensina a ser menina: O sexismo na escola. Campinas: UNICAMP. Müller, A. (2009). Voleibol: Desenvolvimento de jogadores. Florianópolis: Visual Books. Partridge, J. (2011). Current directions in social influence: Parents and peers. Revista Iberoamericana de Psicología del Ejercicio y del Deporte, 6 (2): 251-268. Patton, M. (2002). Qualitative research and evaluation methods. (3rd ed.). London: Sage. Pavlik, M. (2005). Percebendo as responsabilidades de um treinador-modelo. (D. Shondel, C. Reynaud, Orgs. ), A bíblia do treinador de voleibol, pp. 27-35. São Paulo: ArtMed. Pires, G. (2005). Gestão de desporto: Desenvolvimento organizacional (2nd ed.). APOGESD. Podlog, L., Eklund, R. (2007). Professional coaches’ perspectives on the return to sport following serious injury. Journal of Applied Sport Psychology, 19 (2): 207-225. Quivy, R., Campenhoudt, L. (2005). Manual de investigação em ciências sociais (4 ed.). Lisboa: ª Gradiva. Resende, B. (1995). Levantador, uma simples questão de personalidade. Revista Vôlei Técnico, 1 (3): 5-11. Rubin, J.R., Rubin, I.S. (1995). Qualitative interviewing: The art of hearing data. Thousand Oaks, CA: Sage. Schmid, A., Peper, E. (1991). Técnicas para el entrenamiento de la concentración. (J. Williams, Ed. ), Psicología aplicada al deporte, pp. 393-411. Madrid: Biblioteca Nueva. Smoll, F. (2000). A comunicação do treinador com os pais dos atletas. Lisboa: Centro de Estudos e Formação Desportiva. Smoll, F., Smith, R. (1989). Leadership behaviors in sport: A theoretical model and research paradigm. Journal of Applied Social Psychology, 19: 1522-1551. Solomon, G. (2002). Sources of expectancy information among assistant coaches: The influence of performance and psychological cues. Journal of Sport Behavior, 25: 279-286. Solomon, G., Lobinger, B. (2011) Sources of expectancy information among coaches: A cross cultural investigation. Theories and Applications: The International Edition, 1 (1): 46-57. Tesch, R. (1990). Qualitative research: Analysis, types, and software tools. Philadelphia: Palmer. Turner, B., Chelladurai, P. (2005). Organizational and occupational commitment, intention to leave and perceived performance of intercollegiate coaches. Journal of Sport Management, 19 (2): 193-211. University of Porto (Portugal), in partial fulfillment of the requirements for the Ph.D. degree in Sport Sciences. ISNAD Vieira, Ana , Dias, Cláudia , Corte-Real, Nuno , Fonseca, António . "The organization of the sport process: The perspective of elite volleyball Brazilian coaches.". 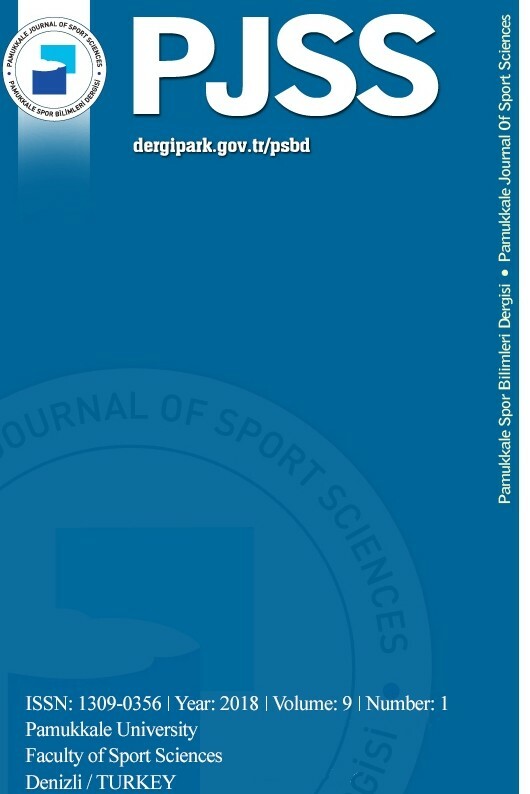 Pamukkale Journal of Sport Sciences 5 / 1 (January 2014): 1-32.